We know them. These are the coffee roasting companies that made their reputations as innovative locally based roasters, and eventually came to model a new kind of coffee institution, one built around a revived intimacy between coffee and customer, precisely described high-end microlot coffees brought to dramatically light roasts, minimalist café interiors, free public cuppings, and pedagogical baristas. These are the companies that helped lead a new movement in specialty coffee and helped provide models for at first scores, now hundreds of similar small, locally based roasting companies opening throughout the world. Over the past few years, however, several of these smallish and local companies have grown large and national, while still trying to preserve the special standing they established early on among an ever widening net of admiring consumers. This is not the place to go into where the money came from for these expansions and who got purchased by whom (consult the business press), but Intelligentsia Coffee, Stumptown Coffee, Counter Culture Coffee and Blue Bottle Coffee are all celebrated small-scale innovators that have expanded over the past few years as they explore how they can manage being big and small at the same time, intimately local, yet nationally present. Meanwhile, other much larger companies that grew up riding the previous “wave” of specialty coffee are trying to find a way back to being small and cool again, to claim for themselves at least a little of the panache associated with the latest trend toward small-lot, medium-roasting companies. To this end, about a year ago, Starbucks launched its Reserve program of small-lot coffees, a product line powered by the buzz created around its showplace demonstration roastery in Seattle. And Allegro Coffee, although its main roasting establishment is based in Colorado and owned by Whole Foods, has opened satellite roasteries, branded as Allegro Coffee Roasters, on both coasts, offering impeccably sourced and roasted small lots. In most cases this expansion (Intelligentsia, Stumptown, Blue Bottle) or targeted contraction (Starbucks, Allegro) has been in part carried out by opening satellite roastery café locations, where consumers can stop by and pick up fresh-roasted small-lot coffees over the counter. This is an honorable and admirable approach, and frankly the best approach from the point of view of freshness and intimacy with the product, but these companies can’t open satellite roasting locations everywhere, plus Counter Culture sells its freshly roasted coffees only through restaurants, cafés and specialty food stores owned by others. Consequently, most consumers interested in sampling the high-end, small-lot coffees from these six companies (or from their special small-lot product lines) must necessarily order them online. That, at least, was the premise for this month’s testing and report. We ordered a minimum of five coffees from the websites of each of six companies: Intelligentsia, Stumptown, Blue Bottle, Counter Culture, and the small-lot lines of Starbucks Reserve and Allegro Coffee. We ordered them anonymously. All were whole-bean. We tried to order a range of typical coffee types consumers might look for: at least one wet-processed Colombia or Central America, for example, one wet-processed Africa, a Sumatra or similar Indonesia, a dry-processed or “natural” coffee, and at least one selection from a particularly rare or unusual origin. That was the goal. In fact, we ended up with a much less coherent, rather random collection of coffees from the six roasting company websites. To these companies’ credit, they do not offer the same kind of coffee selection. Stumptown, Intelligentsia and Counter Culture offer primarily washed or wet-processed coffees; the unstated focus appears to be on coffees that offer variations on a pure, classic cup. On the other hand, Blue Bottle’s relatively small online selection is heavy on blends. Allegro Coffee Roasters offers a lively selection of well-curated small-lot coffees at its satellite roastery in our neighborhood, but its online selection of such small-lot coffees was not particularly robust. Consequently, we ended by supplementing two of Allegro’s special small-lot coffees with three of its more standard, generic single-origins. And, to our surprise, these coffees, with their generalized, old-fashioned origin names, turned out to be quite impressive, attracting ratings averaging as high as any of the other roasters’ fancy, specially selected small lots. Scroll down for roaster-by-roaster remarks and ratings summaries. But first, a few general observations. Coffee selections. Generally, selections of small-lot coffees from most of these roasters were globe-spanning and exciting, though less so in the case of the blend-heavy Blue Bottle menu. The Allegro menu offered a large range of standard, generically described single-origins (Kenya, Sumatra Lintong, etc. ), though few seasonal small-lot selections. Roast. With all samples except those from Starbucks Reserve, the roasting was medium to light. But Starbucks? Still at it. All five Starbucks Reserve samples were roasted darkish to dark. They were not burned or charred, by the way, just roasted too dark to, in most cases, even come close to persuasively showcasing the nuances of their green-coffee character. Single-origins rule (or the listlessness of blends). Clearly, most of these companies or programs lavished their creativity on sourcing and showcasing exciting small-lot single-origin coffees. The few blends we tested came in on average considerably lower-rated than single-origins from the same company. Most of the blends simply tasted tired, blunt or listless by comparison to the fresh, strongly stated expressions of the seasonal single-origin coffees. From one perspective, this result simply reinforces the argument for concentrating on fresh, seasonally selected single-origin coffees offered on a changing, rotating basis rather than on year-round blends, an argument that clearly appears to drive the online offerings of Intelligentsia, Stumptown, Counter Culture and Starbucks Reserve. On the other hand, it may be that some companies, despite their distinction, are still falling back on the regrettable specialty coffee tradition of using blends to move faded green coffees out of the warehouse or to reduce costs. Blends, of course, do not have to be drab or boring, or even year-round. When we do our holiday cupping we always receive some astounding blends consisting of creative combinations of very distinctive, high-end, seasonally fresh coffees with impeccable credentials. Delivery and packaging. For those interested in a primer on specialty coffee packaging and its implications for the consumer, consult our February 2016 Tasting Report where we discuss various packaging strategies and freshness issues. Most of the samples we tested for this month’s article, aside from the five Starbucks and three of the Allegro Coffee samples, were packaged in simple, informal ways that allow staling oxygen to remain in the bag with the coffee after packaging. Rather than depending on high-end, oxygen-evacuated packaging, as Starbucks does, for example, these companies depend on to-order roasting and rapid delivery to reduce risk of staling. All of these informally packaged samples bore roasted-on dates, which, assuming these dates are correct, allow consumers to judge how long the coffees have been in the bag since roasting. To measure the efficiency of this approach when applied to mail-order, we kept track of the number of days that elapsed between the roast dates on the bags and the dates the coffees were delivered. See the results in the summaries of each roaster’s performance below. We are happy to report that Counter Culture and Blue Bottle did extremely well, delivering within two days after roasting. Stumptown also did very well, delivering at three days, and Intelligentsia fairly well at five days. Allegro did not do well at all with the two roast-dated samples it sent. See the Allegro summary. The packing of coffees for shipment was fairly haphazard in the case of all roasters. Several of these orders were delivered during a rainy week in California, and the boxes were soaked from being outside for a few hours. While roasters are not responsible for rain and where the parcels were left, they are responsible for how well the coffees were originally packed at the roasteries. Each of the six shipments was protected only by either a) a small amount of loose bubble wrap or b) paper wrapping that wasn’t affixed to the bags of coffee. The Starbucks shipment was sent in a box at least three times too big for its contents. Overall: Of the six roasting companies we sampled, Intelligentsia attracted the highest average ratings for its five precisely sourced single-origins. The Ethiopia Intelligentsia Benti Nenqa Ethiopia (reviewed here at 93) rated highest of the five; lowest rated was the Ljulu Lipati Zambia Limited Release (reviewed here at 89). Website: Intelligentsia’s online store currently offers a menu of more than fifteen single-origin coffees, plus espressos and blends. One click takes you directly to a coffee and a short paragraph overview that includes information about the origin and producer, followed by technical information (though excluding processing method), a map and photo. Below this basic information is a link via which you can download a pdf providing a more detailed narrative about the coffee. Overall: Counter Culture averaged a rating of exactly 90 extended over five samples, including four very specifically identified small-lot single-origins and one blend, the rather stolid 88-rated “The Natural,” not reviewed here. 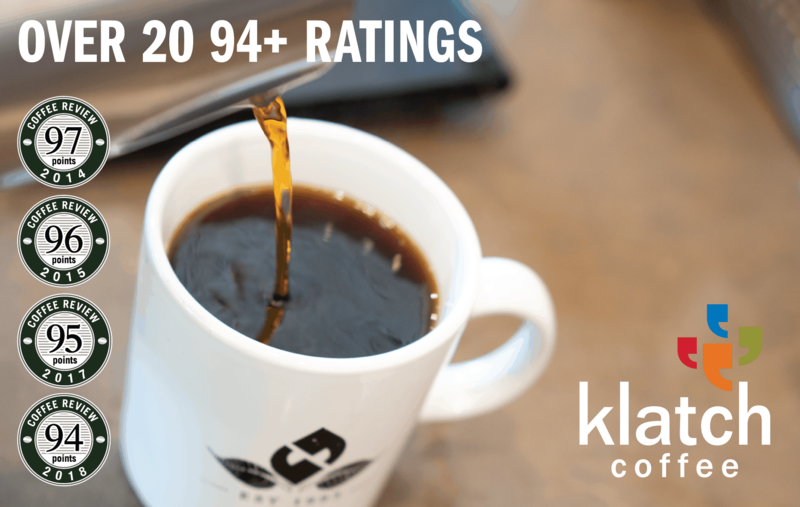 The highest-rated of the four single-origins was the delicate, honeyish Cueva del los Llanos Colombia reviewed here at 92. We also review the interesting Boka Papua New Guinea, an elegant and rather rare coffee that we rated 88 after reluctantly deducting 3 points for one off-tasting cup. The Counter Culture bags were composed of a bio-degradable material called Biotre. Compostable coffee bags are obviously a very attractive idea, but based on information on the manufacturer’s website, composting these bags at present is rather cumbersome and, if you compost in your backyard, excruciatingly slow. You need to remove three parts of the bag before composting (tin tie closure, valve and label) and if you compost in your backyard, 40% of the bag material will not break down for several years. We could find no published tests measuring oxygen impermeability for this promising but still very experimental bag material. Website: Counter Culture Coffee currently offers more than twenty coffees via its online store, easily searchable by region, single-origin or blend, limited release, and year-round (as opposed to seasonally available). There is a wealth of information about each coffee, from its origin and history to its producers and processing method, including photos and maps, as well as tasting notes. Packaging: Sealed foil or foil-lined bags with one-way valve. Bags for the two Allegro Coffee Roasters small-lot coffees were apparently not flushed or vacuumed before filling, and showed very high residual oxygen, an average of 19%, close to the oxygen percentage in the atmosphere. However, the three Allegro Coffee samples packaged in the sturdier, industry-standard Allegro foil bags registered lower residual oxygen: an average of 9%, with one sample at the ideal 0%. Overall: Allegro averaged just under 90 for five coffees, all single-origins. However, the two highest-rated samples were generically defined single-origins offered under the Allegro Coffee brand rather than selections in the small-lot Allegro Coffee Roasters collection. The Allegro Kenya Grand Cru (reviewed here at 93), for example, was apparently comprised of unidentified auction-lot Kenyas. 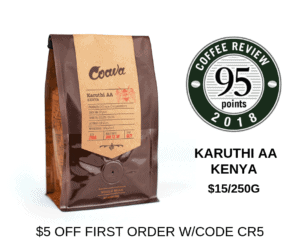 Nevertheless, it was a superb, very characteristic Kenya, and tied with three other, more precisely-identified samples (two from Stumptown and one from Intelligentsia) for this report’s top rating. The Allegro Coffee Sumatra Lintong, a classic wet-hulled Sumatra, also impressed with a rating of 92 (not reviewed). On the other hand, two small-lot coffees from the Allegro Coffee Roasters brand, both rather rare origins, an Ethiopia Harrar and a small-producer Java Sunda Hejo, did not greatly impress, having doubtlessly suffered from some staling after roasting and before delivery. Both bags were roast-dated, but were shipped 17 days after the roast date, and the sealed, foil-lined packaging apparently did not help, as both samples arrived with about 19% residual oxygen, only a little less than atmosphere. We review the Java Sunda Hejo here at 88. All samples were shipped from Allegro’s main facility in Colorado, not from our local Allegro satellite roastery. Website: Allegro Coffee and Allegro Coffee Roasters coffees are sold via the same website and together offer upwards of forty different coffees for sale at any given time. Both brands offer minimal information about the coffees themselves. Descriptions of coffee blends include the countries of origin and the roast style, along with any certifications (such as organic), while descriptions of single-origin coffees add only a sentence or two about the coffees’ producers. Packaging: Tin-tie bags, secured but not sealed. Overall: Owing to our efforts to sample a range of coffee types, we ended by ordering eight rather than five samples from Stumptown. They ranged in rating and interest enormously. Four distinctive high-rated single-origins from Africa rated 93 to 91, including the exceptional Ethiopia Nano Chalia (93) and the Rwanda Huye Mountain (93) reviewed here. Three Stumptown samples from Latin America coffees lagged a bit, one at 90 (the Guatemala Bella Vista reviewed here) and two at 87. Two blends definitely disappointed at 86 and 85. Website: Stumptown’s boldly graphic but rather slow-responding online shop is searchable by Africa and Latin America coffees and blends only, but all available coffees (more than thirty) can be seen by scrolling down the (very long) landing page. Once you click through on a coffee, you’ll find succinct information, starting with tasting notes and followed by information about the producers and region. You can click through to an additional page of information that is photo-driven and includes notes about processing methods. Packaging: Sealed foil bags with one-way valve. Bags apparently were not flushed or vacuumed before filling, although residual oxygen percentages (a measure of how successfully packaging protected the coffee against staling; range is 0% to 20%) were relatively low, averaging 8%. Overall: Ten months ago, as part of a larger report, we tested a range of coffees purchased directly from the Oakland, California Blue Bottle roastery. Ratings for those single-origin, bought-on-site samples were quite impressive: an average of 92. For this Internet-based sampling, carried out ten months later, ratings were decent, though not nearly as impressive, perhaps because this time around we ended up ordering mainly blends rather than single-origins. This month’s five samples averaged just under 89, three points lower than the samples tested in June. The highest-rated of the five, the current incarnation of Blue Bottle’s Three Africans organic blend, is reviewed here at 91. The only sample we ordered from the website’s very limited selection of four single-origins, the Guatemala Alta Verapaz Santa Isabel, also rated 91. We added a review of a mid-rated sample, the Beta Blend, at 89. Website: Blue Bottle offers a small online shop that features subscription options for regular, prepaid home delivery of coffees. Currently four blends and four single-origin options are offered, along with three espresso blends and a decaf. Information on blends is limited to countries of origin, any certifications (such as organic) and a chatty though succinct characterization of the sensory virtues of the blend. For single-origins, the site adds more specific information, including identifying the farmer or cooperative that produced the coffee. Roast-dated? No. Only “best-by” dates are indicated. Packaging: Sealed foil bags with one-way valve. These bags were obviously flushed and/or vacuumed before filling, as all tested showed an exemplary 0% average residual oxygen (percentage of residual oxygen is a measure of how successfully packaging protects the coffee against staling). Time elapsed between roast date and delivery: Not applicable, given Starbucks’ state-of-the-art, 0%-oxygen packaging and the implied justification it offers for not providing roasted-on dates. Shipping and delivery from Starbucks were slow, however; the coffees we ordered were shipped a full six days after we placed our order. Overall: Starbucks Reserve Roastery offered an adventurous assortment of interesting origins. However, all of those we tested were roasted dark enough to pretty much obscure any origin-related character. The one exception among the five tested samples was the Starbucks Reserve Yirgacheffe Chelba, reviewed here at 91, a fine dried-in-the-fruit or ”natural”- processed Ethiopia so pronounced in its cleanly intricate character that an engaging version of its fruit, flowers and cocoa character survived the roast, albeit turning rather dry and spicy. On the other hand, the Starbucks Reserve Sumatra Aceh, reviewed here at 89, was a pleasant cup but so overwhelmed by the roast that it was difficult to tell whether the green coffee represented a classic, wet-hulled, fruit-and-tobacco style Sumatra (most likely) or a conventionally washed coffee of the style also produced in the Aceh region of Sumatra. As was the case with all of the Starbucks Reserve coffees, the paragraph of text on the bag contained almost no technical information about the coffee itself and whatever factors might be assumed to have influenced its cup character. Website: Starbucks’ huge online store features, on its coffee page, a pop-up promotion for its newsletter, as well as a menu of formats, from whole-bean and ground coffees to pods and instant coffees. There’s also a search function that allows you to narrow down by roast, region and flavor. Once you get into the section dedicated to the Starbucks Reserve small-lot offerings, the focus of this month’s reviews, the actual selection of coffees is quite extensive and adventurous, although description about them is limited to basic information on variety and processing method in list format, brief tasting notes, and some paragraphs of what amounts to coffee travelogue. If you can, buy local, directly from locations close to where the coffees are roasted. Such locations would include the retail locations of many local companies we review and that advertise with us, as well as locations of the larger companies whose coffees we review here. It is remarkable how high the coffees we bought directly over the counter from our local Allegro Coffee Roasters and Blue Bottle locations rated in recent months, as compared to the good, yet relatively lackluster ratings for coffees we purchased online from these two companies for this month’s report. Nevertheless, the companies we review in this report are trying hard to bring fine small-lot single-origin coffees to customers via the Internet, with interesting coffee selections, extensive descriptions, and (in most cases) prompt shipping after roasting. But based on the results of our testing, the very best and most distinguished small lots are not being offered by these companies. Perhaps there is not enough volume available of these often tiny lots to warrant publicizing and selling them on the Internet. The very best, superfine microlots appear to be either being offered by smaller, more agile companies, or perhaps even offered as specials over the counter at the roastery cafés operated by some of companies reviewed here. Nonetheless, you are generally better off buying from any of the Internet sites than shopping for coffee at your local supermarket or general specialty food store. We base this observation on the coffee ratings of our supermarket survey from this past February, Trolling the Supermarkets for Single-Origin Coffees. Given the emphasis among these six companies on seasonal offerings of small-lot single-origins, go for the single-origins and not the blends. This advice probably applies to almost all leading edge roasting companies today. The only time this observation appears to break down is during the holidays, when many companies compete to see how brilliant and special they can make their holiday blends. Kenneth Davids is the co-founder and editor of Coffee Review, as well as its primary cupper and writer. Associate editors and co-cuppers contributing to this article and reviews include Jason Sarley, experienced coffee taster and certified Q-grader, and Kim Westerman, a widely published food writer and certified wine sommelier.